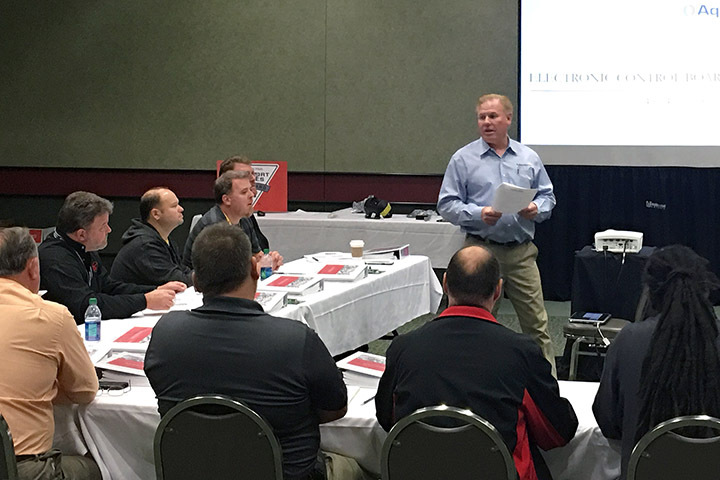 At the recent RVIA Trade Show in Louisville, Kentucky, Aqua-Hot Heating Systems, industry leader in vehicle hydronic heating, participated in the RVIA Technical Academy. 20 attendees from RV dealers and service centers completed the Aqua-Hot Certified Technician Training Program. Their companies are now eligible to become Factory Authorized Service Centers. Requests for training exceeded the capacity of the RVIA show. Students at the eight-hour event learned about Aqua-Hot's innovative 400 and 600 series line of heating systems, and their operation. They became proficient in diesel and propane burners, maintenance, leak detection and how to troubleshoot an Aqua-Hot heating unit. Aqua-Hot recently overhauled its certification program to accommodate RV technicians' busy schedules and make them more accessible. Now a single day, training is held at the Aqua-Hot facility, dealerships and regional events. Information on attending or scheduling a Certified Technician Training Program is at aquahot.com/authorizedservicecenterprogram.aspx. Since 1984, Aqua-Hot hydronic heating systems have been in use in RVs, trucks, buses and off-highway equipment. Providing even interior heat and on-demand continuous hot water, models run on diesel, propane and natural gas.